Project Blue Beam is a NASA plan in which they allegedly will try to implement a New Age religion to start a new world order. 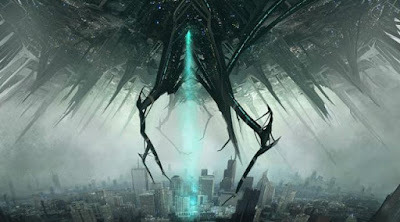 The means to create this new world order involve technologically-simulated alien invasions. The project was leaked by journalist Serge Monast in 1994. He later published a book to describe NASA's plans to invoke this new world order. In 1996 Monast passed away. The official explanation was that he suffered a heart attack. Strangly another journalist that was investigating project Blue Beam died in similar circumstances. Richard Dolan gives some personal insights in the theory of project Blue Beam via his contacts at Nasa. How is NASA going to implement this and what are teh logistical challenges? Step One involves the breakdown of all archaeological knowledge. This will be done by faking earthquakes and creating false archaeological proof. Step Two involves fake alien invasions using three-dimensional holographic laser projections. These invasions will take place simultaniously all over the globe. Images of popular religious symbols will be mixed in. Step Three is "Telepathic Electronic Two-Way Communication." It involves making people think their god is speaking to them through telepathy. To achieve this low frequency radio waves will be used. It seems important to keep in mind the possibility of our governments faking an alien invasion to create a new world order.